Cook the chicken in a pan with the butter and garlic. Season with salt and pepper and let fry for 15 minutes. Add the chopped mushrooms and pour on the mushroom cream. Cover the pan and let cook for 10 minutes. Sprinkle on the cilantro before serving. You can use boneless chicken breast in place of the chicken leg. Recipes like this are great for days when we don't have the time for a complicated dinner. 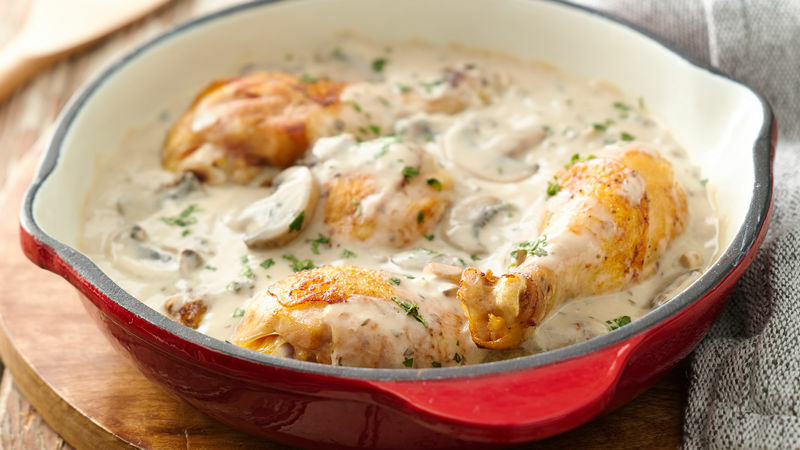 In less than 30 minutes you can prepare a mouthwatering dinner of chicken covered in creamy mushroom sauce. The cilantro gives the dish a special touch with its aroma and familiar Latin flavor. I recommend serving this dish with white rice or potatoes to get the most out of the creamy sauce. Always have quick recipes at hand. They can help you save time while offering delicious meals.